While flipping through past issues of the Technique Junkies Newsletter looking for techniques for the Kind Thoughts Flourish, I thought I'd morph a few and create something a bit funky. Thus the background here. So, what did I do? 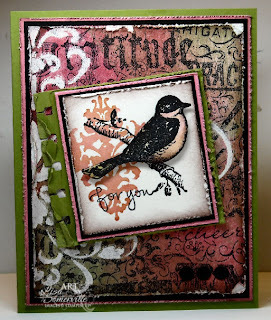 I really had the Faux Designer Paper Technique in mind - but that's created with stamped images, and the Kind Thoughts Flourish is a stencil, so I thought Batik combined with the look of the Faux Designer Paper would be cool. So, morph the two - and I suppose you get Stencil Batik Designer Paper. To create my background, I brayered White Craft Ink over my stencil (make sure your ink is nice and moist), remove stencil and immediately clear emboss. Swipe ink over card stock, spritz with water to help blend your colors. I covered my card stock with copy paper and used my Clover Craft Iron to melt the embossing from my image. You'll know you embossing is completely melted with the copy paper freely lifts from your card stock. As in my post from the other day - the Damask Image is inked then spritzed before stamping onto my watercolor paper. this is GORGEOUS!!!!!! i wish i could say i was going to case it...but i could never do it justice! totally inspiring...this piece. Really you should frame it.. Isn't it fun when you find your mojo.. Your work just keeps getting better and better all the time, Lisa. This card is AWESOME, and you are an inspiration. TFS. Wow, this card blows me away, it is AWESOME. I will definately have to make one. The biggest problem will be not copying exactly since I love everything about it. Can't find one thing I would want to change. Thanks so much for sharing. You are truly talented. yes. i love this one too! I loved everything in between too but i really love this one too! articulate aren't i?